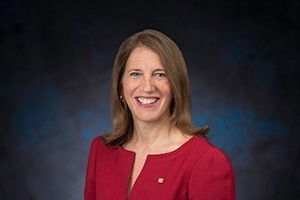 American University will celebrate the inauguration of Sylvia Mathews Burwell as AU's 15th and first female president on Thursday, April 12, in Bender Arena. The inauguration ceremony, beginning at 11 a.m., will bring together a passionate community of students, faculty, staff, trustees, alumni, as well as distinguished visitors and guests to honor President Burwell. Her inaugural address will speak to American University's history, uniqueness, and its future. "On behalf of the Board of Trustees and the AU community, it is my privilege and a pleasure to formally welcome Sylvia Burwell as our new president with this wonderful celebration," said Jack Cassell, BA '77, chairman of the AU Board of Trustees. "Sylvia is a phenomenon with a vision to move AU towards reaching its full brilliant potential. American University is uniquely positioned to be one of the nation's top universities. I have great confidence in Sylvia's leadership and what she will bring to the legacy of AU." "This day is a celebration of just what makes AU so very special," said President Burwell. "The students, the faculty, the alumni, the staff are a connected community with a passion for learning, living, creating, discovering, and making an impact. We celebrate the history, present and future of AU today." Burwell became American University's 15th president on June 1, 2017. She is the former Secretary of the U.S. Department of Health and Human Services (2014-2017) and former Director of the U.S. Office of Management and Budget (2013-2014). Her prior government experience also includes Deputy Director of the Office of Management and Budget, Deputy Chief of Staff to the President, Chief of Staff to the Secretary of the Treasury, and Special Assistant to the Director of the National Economic Council. In addition, she has held senior executive roles at the Bill and Melinda Gates Foundation and the Walmart Foundation. Earlier this year, she received the prestigious Richard L. Elliott Prize for Excellence in Public Service. In less than a year into her presidency, Burwell has met with over a thousand alumni, students, faculty and staff and launched AU's Inclusive Excellence Plan, a far-reaching effort to build a truly inclusive community at the University. She has made it clear that her goal is to "help AU expand its scholarly influence, enhance the student experience, and be a model for inclusion and innovation at a time when these ideals are vitally important." On Wednesday, April 11, AU will host a History Walk to commemorate the 125th anniversary of the founding of the university. All are invited to take a self-guided tour of campus, starting at Bender Library, with a special campus map marked with historical stops and open houses to learn more about how AU has evolved since its founding in 1892. Immediately following the inauguration ceremony on April 12, there will be a university-wide picnic with music and student performances from 1-2:30 p.m. on Friedheim Quad. The event will conclude with a Future Walk from 2-4 p.m., complete with interactive exhibits, talks, and performances at the Don Meyers Technology and Innovation Building on the new East Campus.